Addiction and withdrawal symptoms can be powerfully treated with acupuncture due to acupuncture’s close relationship with the nervous system. The main goal of acupuncture is to restore balance to the body and it taps into balancing the endocrine, immune, nervous, and digestive systems to encourage the body back into balance thus relieving symptoms that arose from imbalance of these systems. Addiction creates imbalance in the body that creates physical and mental symptoms that are difficult to deal with. Acupuncture can help with addiction and withdrawal symptoms by balancing the body’s hormones and chemicals, increasing relaxation, managing cravings, and alleviating withdrawal symptoms. Acupuncture also enhances mood and decreases any pain from withdrawal due to its promotion dopamine production. 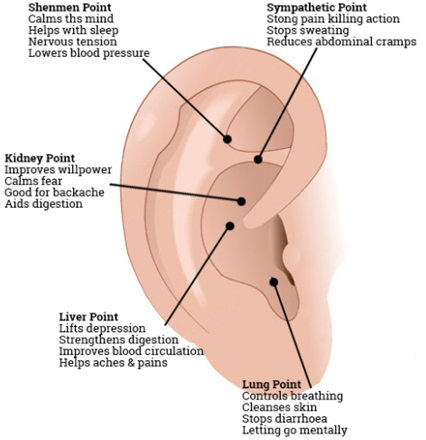 A standard protocol for addiction using ear acupuncture is called the NADA protocol. This method utilizes five major points on the ear to calm the nervous system. The points used are Shen Men, Sympathetic, Kidney, Liver, and Lung. While the NADA protocol is widely used and extremely effective, it is always best to check in with your acupuncturist to determine how it fits into your personalized treatment protocol. 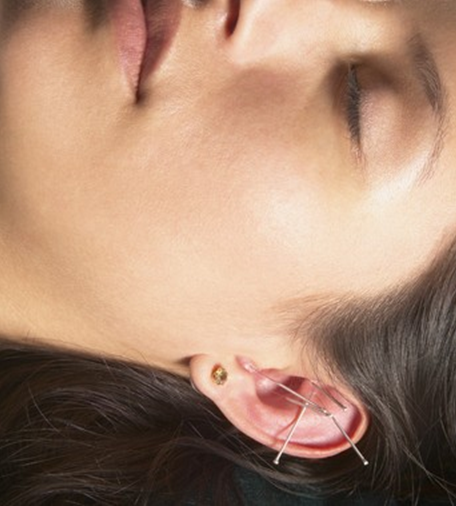 Each patient has different root causes and symptoms leading practitioners to create custom treatment protocols utilizing body acupuncture, ear acupuncture, and herbs with the addition of the NADA protocol. This ensures that the patient’s have the most effective treatment due to the personalized nature of Acupuncture and Chinese Medicine. To see these protocols in action, please watch our Ear Acupuncture Demonstration video.